Those who have not read the book, please read the book first and then see the movie. Often we see some beautiful gem of a movie which are based on books, wherein the rendition and the picturisation done is so perfect, that you have imagined the entire scene as it is when reading the book. This movie does not make that cut. I was expecting a lot after watching Chronicles of Narnia, so ... the movie turned out to be a slight disappointment. Maybe, the plot itself was too long to unfurl within 2 hours. The IMAX screen helped, leaves your head reeling. 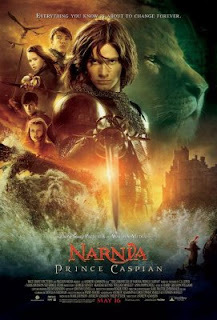 A decent watch ... the story has our four Pevensies back in the world of Narnia and in the middle of a family feud where the evil uncle wants to kill the heir and usurp the throne. Prince Caspian is needless to say the aforementioned heir. Go watch the movie and roar with Aslan (voice over by Liam Neeson). It's a very decent 7.9.